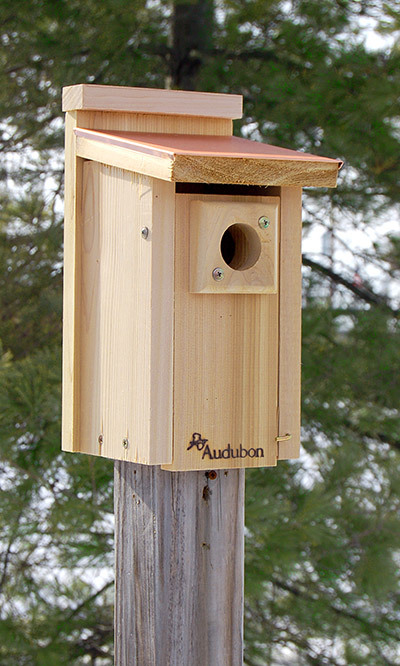 Create an elegant and functional bluebird roost in your yard with the Audubon Coppertop Bluebird House. This lovely home offers style to your garden, while maintaining a proper bluebird abode. The 1.5" diameter entrance hole is the perfect size for bluebirds, and a wooden predator guard surrounds it for added protection. The sloping roof extends past the entrance hole, directing water away from the entry. Copper covers the roof, adding a design element to the piece, which will patina over time for a bold finish. Ventilation gaps at the top of the home help air flow through the unit, and a small slit at the back of the base allows water to drain. The front panel opens for easy maintenance, and a metal latch at the bottom keeps it closed. Two holes on the back of the unit enable it to be mounted onto a post using the two included screws. The 0.875" thick cedar construction keeps the home insulated and forms a lasting item. Help bluebirds thrive in your area with this Coppertop Bluebird House. Made in the USA.